Hygienic Panel Benefits: Composite Fibreglass Mouldings produce bullet proof fibreglass panels, hygienic tile panels with built in antimicrobial protection and bespoke fibreglass mouldings. We find that the product is fast and efficient to use eliminating the use of ceramic tiles and the process of tiling and grouting. Walls can be clad easily and quickly with an appearance of ceramic tiles. What is NoTile™ made from? The panels are made from glassfibre reinforced polyester (GRP) and the colour-carrying layer (gelcoat) contains the silver antimicrobial Biomaster. 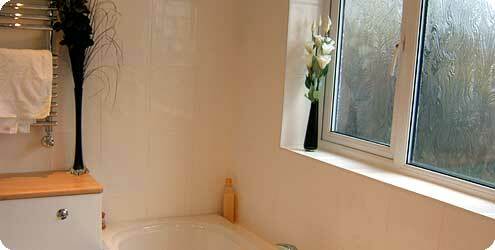 Will the grout lines go black with mould? No. NoTile™ panels are completely different to traditional ceramic products. They do not support the growth of mould because the surface is not porous, unlike traditional grout, also the surface includes a silver antimicrobial, to inhibit the growth of bacteria and mould. White is traditionally held in stock. We can manufacture any British Standard or RAL colour. We can also colour match upon request. However, the grout line will be the same colour as the tile. There are four standard styles of tile; a 200 x 200mm 'bumpy' tile; a 152 x 152mm 'flat' tile and a 330 x 250mm vertical 'bumpy' tile and a new 300 x 100mm brick effect tile. The tile style will determine the size of the sheet. If the volumes are high enough CFM Ltd will manufacture a new design for the client. Panel sizes can be modified during manufacture or cut to size in our own factory. How are the panels fastened to the walls? These very flexible panels can be fixed to plaster, wood, brick and even old tiles using a 'grab adhesive'. CFM Ltd will recommend and supply the adhesive. New plaster will need to be sealed first. How are the panels joined? The preferred method is to fill the joints with gelcoat. This provides a clean continuous membrane rather than visual joints. We supply a joining kit with all orders. We do not supply jointing strips, however they can be used as an alternative. No. We only supply the panels; however, on large jobs we can offer a site visit with demonstration. Each order is sent with full fitting and jointing instructions and we are always happy to discuss fitting and jointing over the phone.